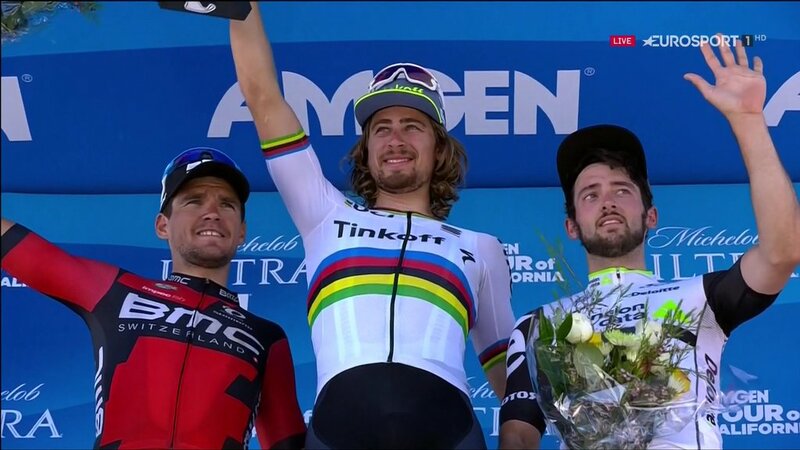 Peter Sagan (Tinkoff) won his second stage of this year’s Tour of California today, after edging out Greg Van Avermaet (BMC Racing) in a close sprint ending at the Laguna Seca race-way. Meanwhile, Julian Alaphilippe (Etixx – Quick-Step) finished in 10th place, preserving his lead in the overall eight-day race. Earlier, Mark Cavendish (Dimension Data) made an unusual appearance in the day’s escape group. 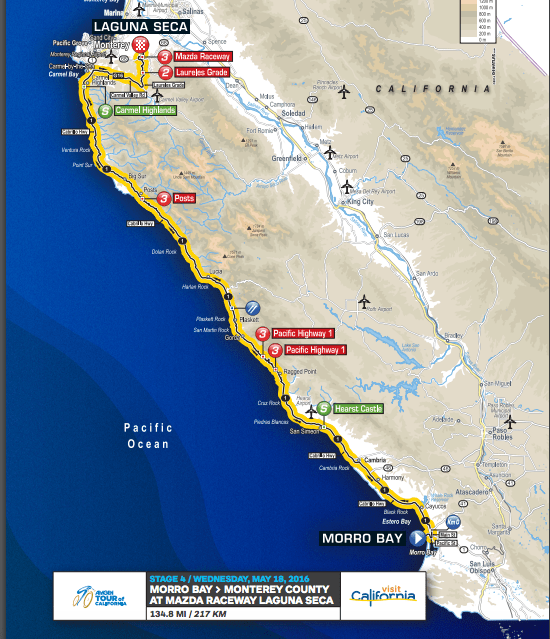 He joined six other riders: Gregory Daniel (Axeon Hagens Berman), Michael Morkov (Katusha), Timo Roosen (LottoNL-Jumbo), Tanner Putt (UnitedHealthcare), Ryan Anderson (Direct Energie) and William Routley (Rally Cycling). The seven riders worked well together over the longest stage of the race, keeping momentum until the final climb, when all but Gregory Daniel were swallowed up by the chasing peloton with 5 kilometers to go. As the riders approached the Laguna Seca raceway up a testing climb, Daniel was caught and the peloton started to split apart. 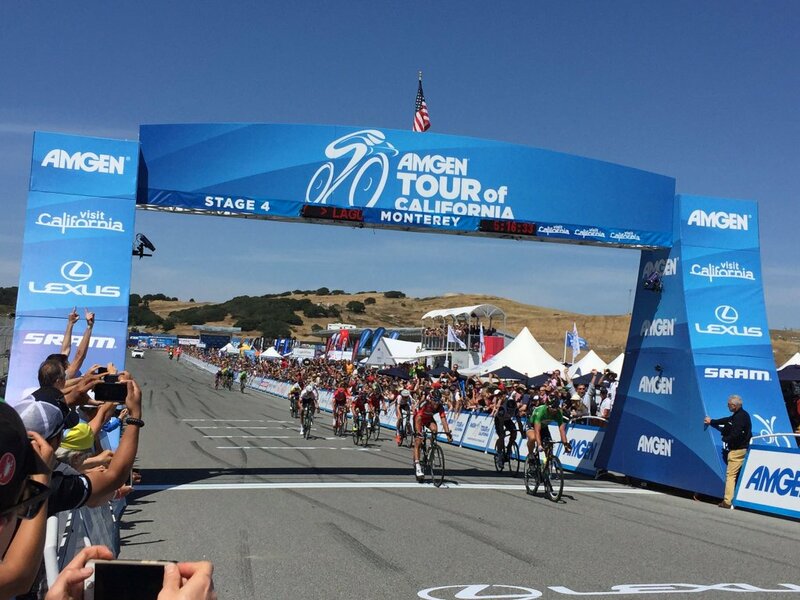 Ruben Guerreiro (Axeon Hagens Berman) and Haas both launched unsuccessful solo attacks on the iconic race track. 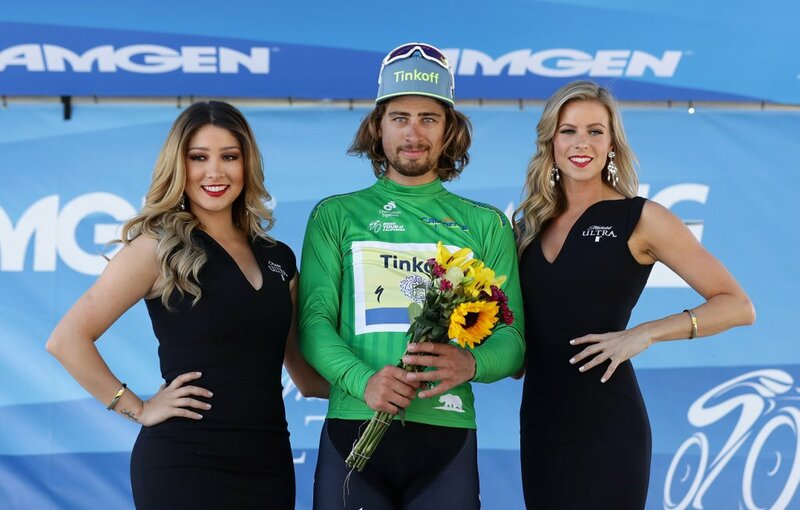 As the lead group swept through the twisting corkscrew section and round into the final bend, Sagan was in prime position. He opened up his sprint and fended off his rivals to take the win.